No longer do cryptocurrency users need expensive mining equipment to earn coins. GCoin allows users to play games and earn coins from any PC, mobile device or tablet. PRLog - Aug. 21st, 2014 - DUBLIN, Ireland -- GCoin is a new P2P cryptocurrency for global use. Account holders earn GCoins through play. This is an attractive alternative to expensive mining and all users have an equal chance to earn coins. The GCoin games are a great free way to acquire a basic knowledge of how cryptocurrency platforms operates. GCoin has just launched a new P2P cryptocurrency platform. Mining is not required to acquire new coins. Users may play online games and earn GCoin cryptocurrecy. New players receive free coins. Decentralized cryptocurrencies are being used in online casinos around the world. GCoins are earned by playing high quality online casino style slot machines. GCoin slot play is an attractive alternative to expensive mining and all users have an equal chance to win coins! No technical mining knowledge needed. The GCoin game is a great way to acquire a basic knowledge of how cryptocurrency platforms operates. Players will win and earn as the platform distributes free pre-mined GCoins. GCoin slots target enthusiastic digital currency users that may have been previously blocked from mining cryptocurrency because of expensive equipment requirements, technical knowledge or a proper Internet connection. The process of playing games and not mining allows anyone to participate in the acquisition of new coins. Mining of GCoins is also possible, but not required to receive new coins because GCoins can also be won through slot play. The operators of GCoin have augmented the process of receiving crypto coins to now include mining, purchase and game play. Anyone with an iPhone, Android, PC or Mac can spin the slots and earn GCoins. For fast and easy withdrawals, the digital wallet is attached to the gaming platform. Players take home the winnings and begin to circulate the coins throughout the cryptocurrency community adding to the growing Gcoin marketplace. The often expensive and time consuming process of mining has been replaced with exciting games of chance. Once GCoins have been earned through play, users can immediately transfer the cryptocurrency into a GCoin digital currency wallet. 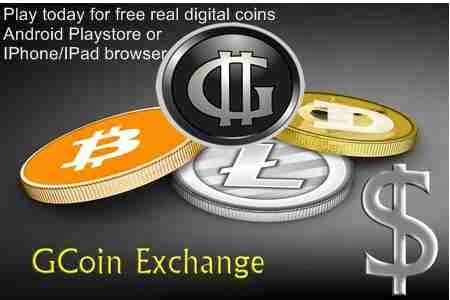 Anyone can then save the currency, exchange Gcoins with a friend, buy goods & services or play more games. Like most brand new cryptocurrencies, today, the value of one GCoin (GCN) is very small. As the system grows more popular and additional games are introduced, it's possible that the value of the coins could rise. With GCoin, anyone can earn cryptocurrency while enjoying mobile and online games. The amount of premined coins to be distributed through the Android GCoin wallet app: 31.5 billion. (G29m + G2.5m mined) The balance of 11 billion GCoins is closely held by management. It is also possible to mine GCoin. Both CPU and GPU mining are supported. A mining pool is up and running at http://www.gcoinpool.com Here is some helpful information on mining. Download the GCoin App and Wallet from the Google Play store for your Android device. Starting playing and winning.